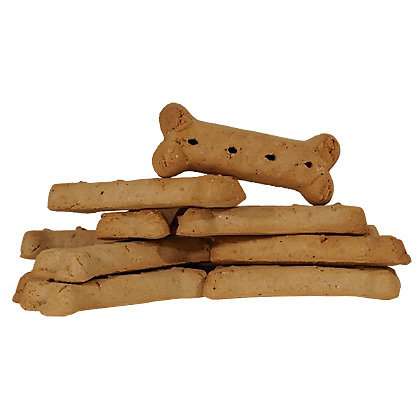 Our gourmet biscuits are dog treats that are tasty and nutritious. We started to send one biscuit for free with every order and then our customers asked us to sell them. And now we do, in a package of two dozen. These are delicious treats at a great price. Give your dog a Gourmet Biscuit for a nutritious treat any time of the day, especially when they are being good! Give Gourmet Biscuits to your dog as a treat or when rewarding good behavior. For a delicious treat that will keep your dog occupied, try theHimalayan Dog Chew. Should be stored at room temperature. Ingredients: Wheat flour, Wheat bran, Poultry Fat (preserved with mixed tocopherols), Meat and Bone meal, Dried skim milk, Calcium carbonate, Dicalcium phosphate, Salt, Potassium Sorbate (to preserve freshness), Choline chloride, Dried Brewer's Yeast, Natural Flavor, Minerals (Zinc sulfate, Copper sulfate, Manganese Sulfate, Calcium iodate, Sodium selenite), Vitamin A Supplement, Vitamin D3 Supplement, Vitamin E Supplement, Niacin, D-Calcium Pantothenate, Pyridoxine hydrochloride (source of vitamin b6), Riboflavin supplement, Folic acid, Biotin, Sodium metabisulfite (used as a preservative), Vitamin b12 supplement. Calories: 106 calories per bone.